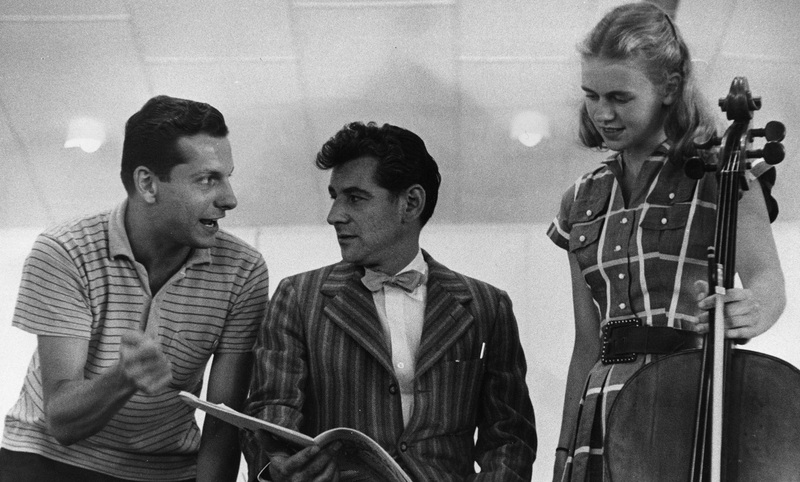 Celebrating the centennial of conductor-composer Leonard Bernstein's birth. 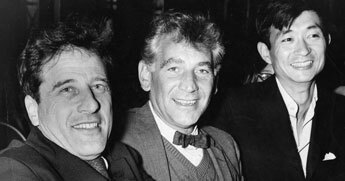 Bernstein's close relationship with the BSO spanned a half-century, from the time he became a protégé of legendary BSO conductor Serge Koussevitzky until the final concerts he conducted with the BSO in 1990. 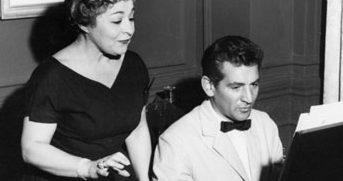 Bernstein makes his first public piano performance in a New England Conservatory recital for students of Susan Williams. He studied with Susan Williams from 1930 to 1932 and paid $3/hour. 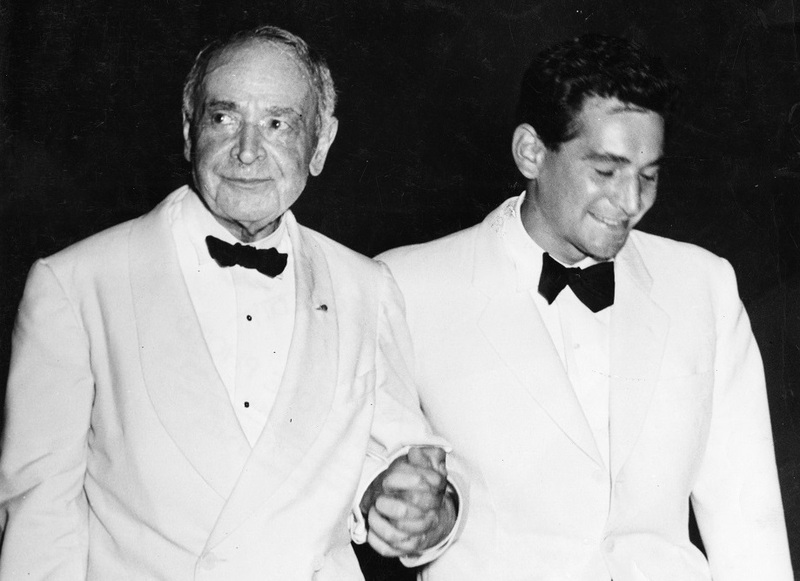 Bernstein sets foot in Symphony Hall for the first time to attend a Boston Pops concert with his father. The program features Arthur Fiedler conducting several works including Ravel’s Bolero and Rossini’s The Barber of Seville. 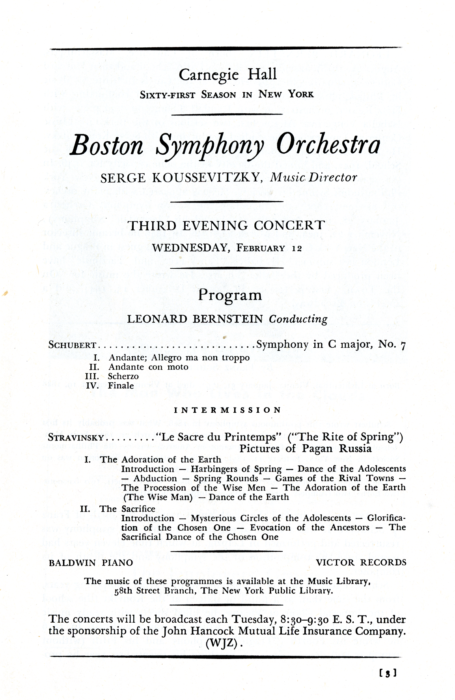 Bernstein purchases a BSO subscription and begins attending concerts regularly. Graduates Boston Latin School. Composes class song, ‘All for One and One for All’. Bernstein takes a summer job as music counselor at Camp Onota in Pittsfield, Massachusetts. First formal appearance as a conductor, leading his own incidental music to a student production of The Birds, at Sanders Theatre, Harvard University. 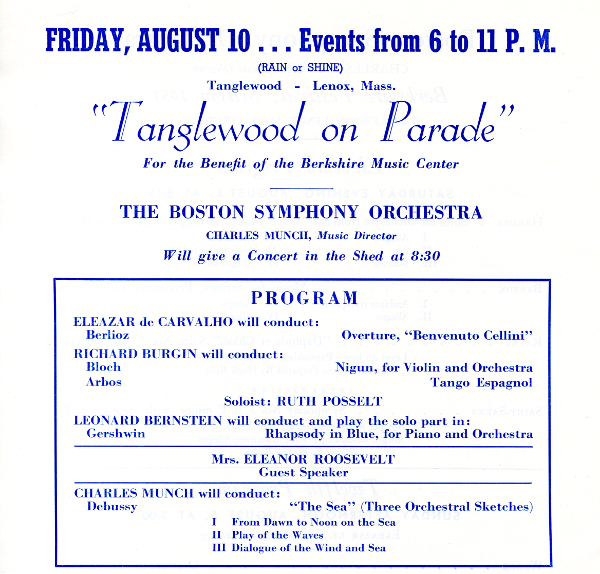 Bernstein attends the Tanglewood Music Center (then called the Berkshire Music Center) during its inaugural year and studies conducting with BSO Music Director Serge Koussevitzky. Click ‘Read More’ to see photos, TMC Yearbook pages, and four programs including works Bernstein conducted. Bernstein conducts the Tanglewood Music Center Orchestra in a performance of the second and fourth movements of Rimsky-Korsakoff’s Scheherazade. This is the first concert he conducted as a TMC student for which there is a sound recording. Leonard Bernstein conducts members of the TMC in a surprise performance of Stravinsky’s L’Histoire du soldat, complete with words made up by Bernstein for the occasion, at Seranak during a tea given by Serge and Natalie Koussevitzky for the students at Seranak, their summer home near Tanglewood. 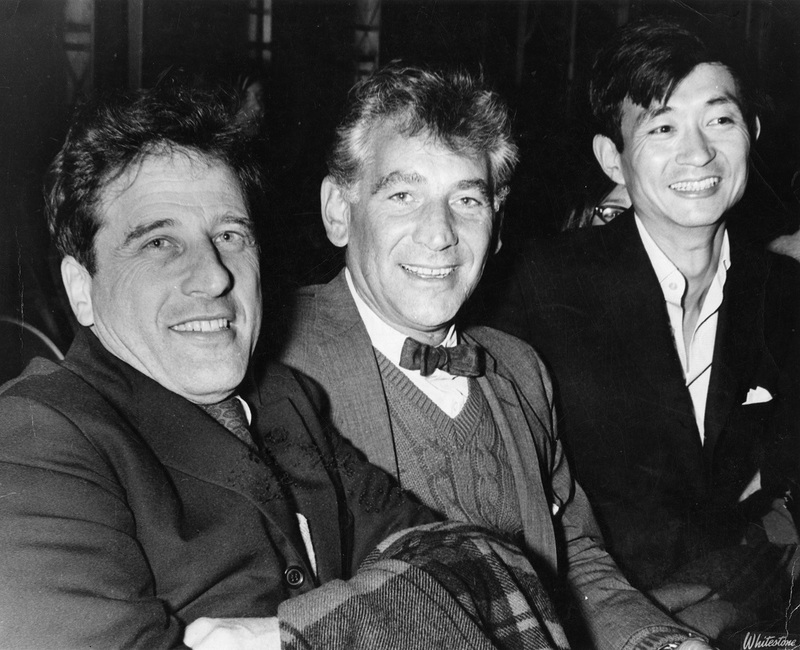 Bernstein and student conductors Lukas Foss, Thor Johnson, and Richard Bales participate in the British War Relief Concert, a precursor to Tanglewood on Parade. Bernstein conducts several works with the Tanglewood Music Center Orchestra as a TMC Fellow including William Schuman’s American Festival Overture, Constant Lambert’s The Rio Grande, Brahms’ Piano Concerto No. 2, and Gardner Read’s Prelude and Toccata. Click ‘Read more’ to view the programs. 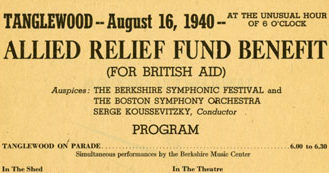 Bernstein makes his debut performance with a professional orchestra, conducting the Boston Pops at the Hatch Shell on Boston’s Esplanade before an audience of 22,000 people. 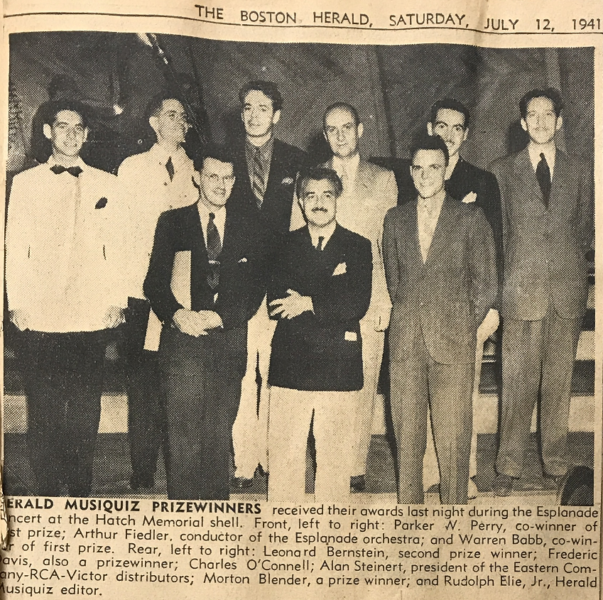 After entering a music quiz organized by the Boston Herald, he was awarded an extra prize – the opportunity to conduct the Boston Pops in a performance of Wagner’s Prelude to Die Meistersinger von Nürnberg. Bernstein returns to Tanglewood and is appointed Koussevitzky’s conducting assistant. 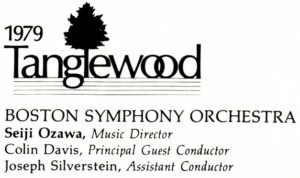 Serge Koussevitzky conducts the Tanglewood Music Center Orchestra in the American premiere performance of Shostakovich’s Symphony No. 7, ‘Leningrad’ in which Bernstein plays the bass drum. 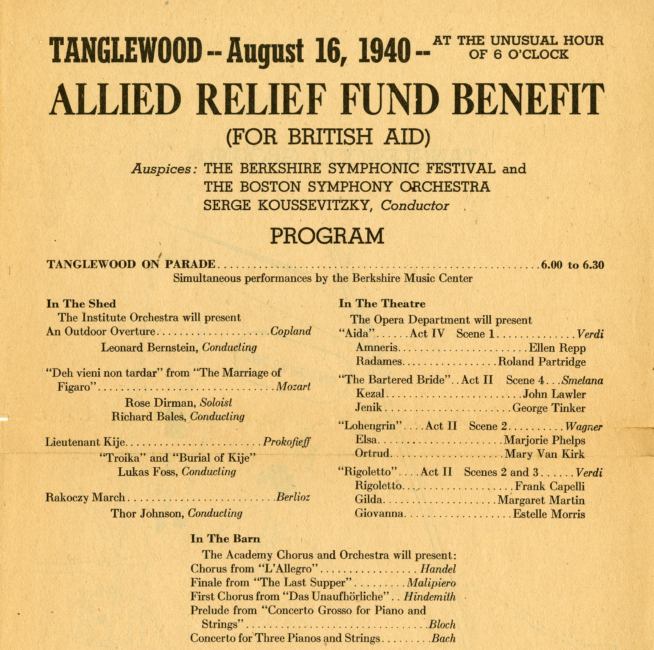 The Tanglewood Festival and Tanglewood Music Center are suspended from 1943 to 1945 due to the war. The Koussevitzky Music Foundation puts on concerts in the Lenox area, including a series of concerts at Sedgewick Hall in the Lenox Library. 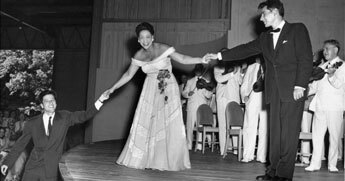 Bernstein performs the premiere of his work I Hate Music with Jennie Tourel as vocal soloist at Sedgewick Hall in the Lenox Library. 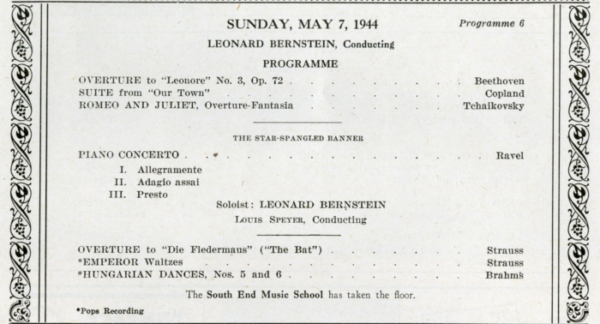 Bernstein performs with the BSO in Symphony Hall for the first time, conducting his own Symphony No. 1, ‘Jeremiah’ and Aaron Copland’s El Salón México. This is the BSO’s first performance of one of Bernstein’s works. 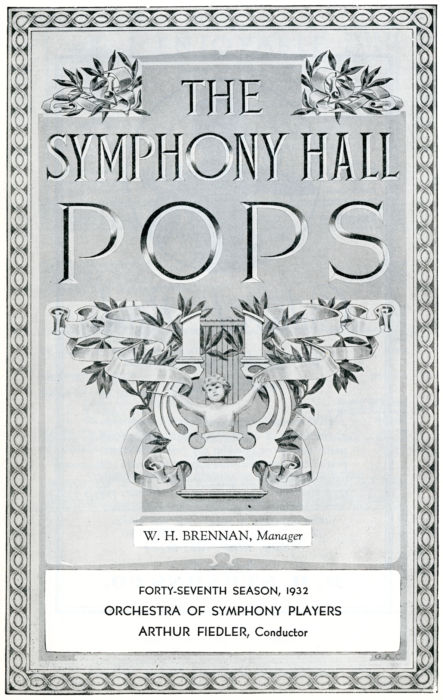 Bernstein appears as a guest artist with the Boston Pops. The program includes a performance of Ravel’s Piano Concerto with Bernstein as piano soloist and Louis Speyer conducting. 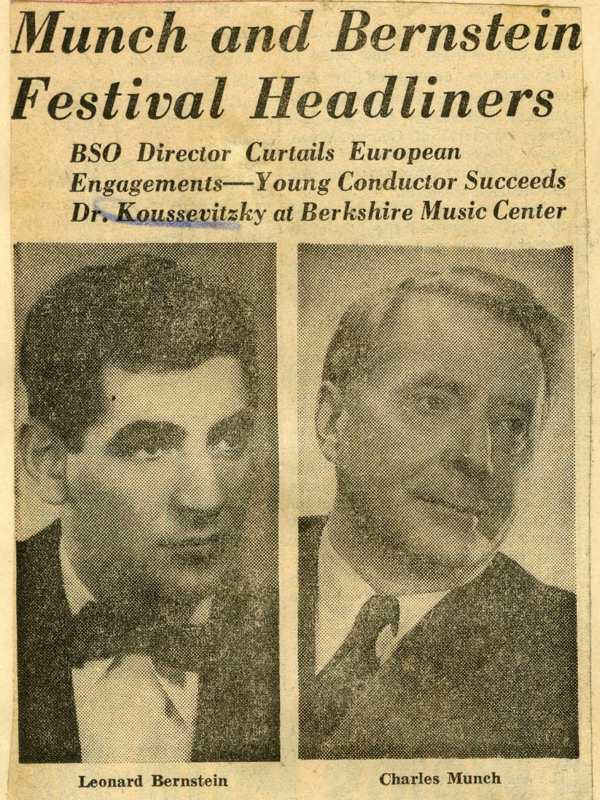 Bernstein returns to Tanglewood in 1946 to serve as Koussevitzky’s assistant at the Tanglewood Music Center following the center’s closure from 1943 to 1945 due to the war. Bernstein served as his assistant in 1942, and continued in this position from 1946 to 1950. Bernstein conducts the American premiere of Benjamin Britten’s opera Peter Grimes in the Theatre-Concert Hall in a production featuring the TMC Opera Department and the TMC Opera orchestra. This was his first time conducting the Tanglewood Music Center Orchestra as a TMC faculty member. Click ‘Read More’ to view program, photo, and review. 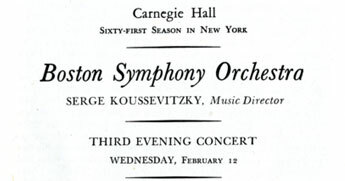 Bernstein makes his BSO at Carnegie Hall debut on February 12th during an orchestra trip. From January 28th to February 23rd he conducted 15 concerts, including performances in Boston, Brooklyn, New York, White Plains, New Haven, and Providence. 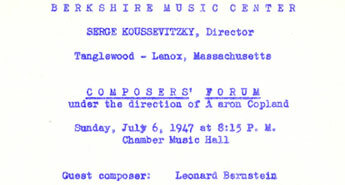 Bernstein performs music from his ballet, Facsimile, on piano as part of a Composers’ Forum at Tanglewood. Bernstein conducts the BSO at Tanglewood for the first time, performing Mozart’s Overture to The Magic Flute, Stravinsky’s The Rite of Spring, and Schubert’s Symphony No. 9. Click ‘Read More’ to view the program and the concert program bio for Bernstein. Bernstein arrives at Tanglewood for a Sunday afternoon concert. This home movie was made by Lenny’s younger brother, Burton Bernstein, circa 1948. Listen below to an audio clip and click ‘Read More’ to view the program. World premiere of Bernstein’s Symphony No. 2, ‘Age of Anxiety’ at Symphony Hall conducted by Serge Koussevitzky with Bernstein as piano soloist. Listen below to an excerpt from Movement 3 – The Seven Stages from the April 9th performance. Bernstein’s Symphony No. 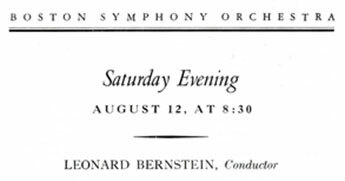 2, ‘Age of Anxiety’ is repeated at Tanglewood with Bernstein as piano soloist and Serge Koussevitzky conducting the BSO. Click ‘Read More’ to see the full Tanglewood on Parade program. 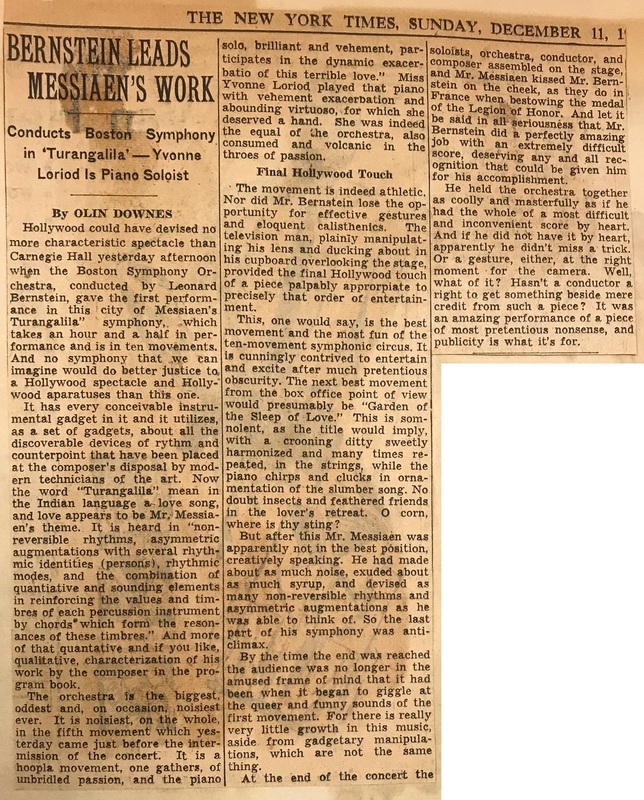 Bernstein conducts the BSO in the world premiere performance of Messiaen’s Turangalîla-Symphonie in Symphony Hall. Below is an excerpt from the rehearsal on November 28th with Bernstein speaking and conducting. Click ‘Read More’ to view the program and concert reviews. Bernstein rehearses Ravel’s Piano Concert in G with the BSO in Symphony Hall, with Bernstein conducting from the piano. 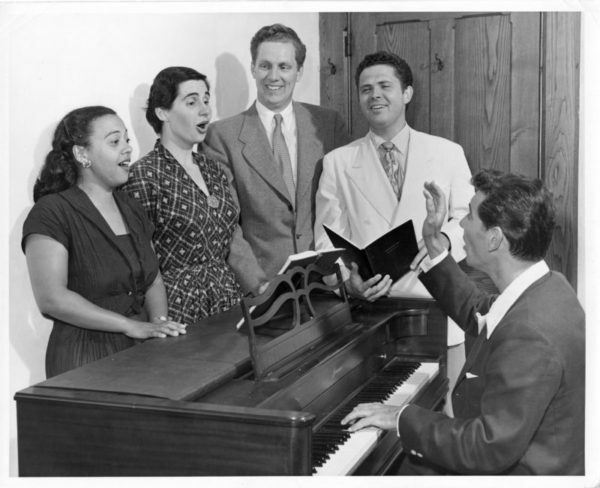 A portion of the rehearsal is broadcast on NBC Radio as part of its “Dress Rehearsal” series. Listen to the rehearsal audio below. 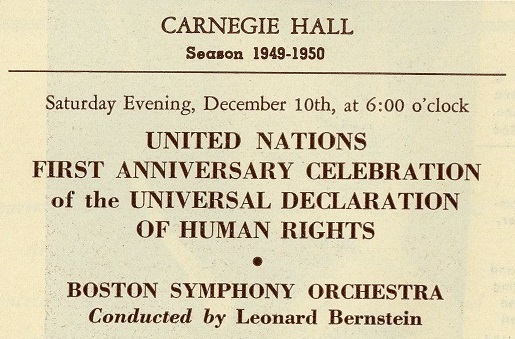 Bernstein conducts the BSO at Carnegie Hall as part of the First Anniversary Celebration of the Universal Declaration of Human Rights. The concert is televised and broadcast live. 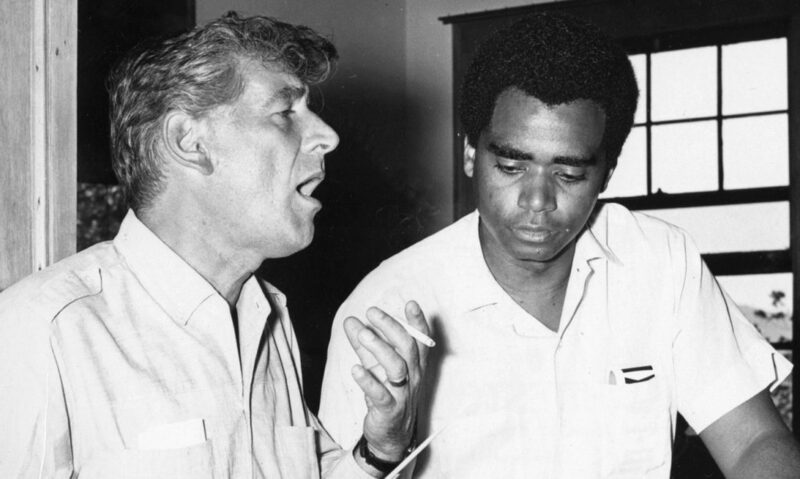 Bernstein conducts the BSO in a performance of Lukas Foss’ Song of Songs: Second Biblical Solo Cantata for soprano and orchestra in the Tanglewood Music Shed. Click ‘Read more’ to see the concert program. Bernstein appears as both conductor and piano soloist in a performance of Ravel’s Piano Concerto in G with the BSO. This is his first appearance at Tanglewood conducting from the piano. 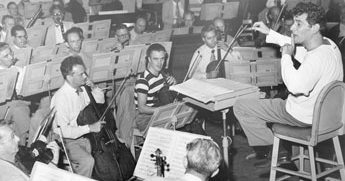 Following the death of his teacher and mentor Serge Koussevitzky on June 4, 1951, Leonard Bernstein takes on the post of Head of Orchestral Conducting at the Tanglewood Music Center. Bernstein is the Head of Orchestral Conducting at the Tanglewood Music Center. Bernstein conducts the BSO in a performance of Beethoven’s Missa Solemnis in memory of Serge Koussevitzky in the Music Shed. Click ‘Read More’ to view the program and a concert review. Bernstein performs as piano soloist and conductor in Gershwin’s Rhapsody in Blue with the BSO as part of Tanglewood on Parade. World premiere of Bernstein’s opera Trouble in Tahiti at Brandeis’ first Creative Arts Festival in Waltham, MA. Several BSO members participate in the Festival. A revision of Bernstein’s opera Trouble in Tahiti is performed by the Tanglewood Music Center Opera Department. Bernstein conducts the BSO in the Koussevitzky Memorial concert at Tanglewood. World premiere of Bernstein’s Serenade at the Venice Festival. 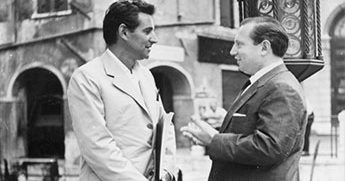 Bernstein conducts the Teatro La Fenice Orchestra with Isaac Stern as the violin soloist. Charles Munch conducts the BSO in the American premiere performance of Bernstein’s Serenade for solo violin, string orchestra, harp and percussion at Symphony Hall with Isaac Stern as the violin soloist. Bernstein conducts the BSO in a performance of Beethoven’s Missa Solemnis at Tanglewood for the Koussevitzky Memorial Concert. Bernstein conducts the world premiere of his Symphonic Suite from “On the Waterfront” with the BSO as part of Tanglewood on Parade. 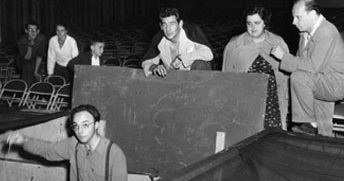 This is also the first time Bernstein performed as a pianist with the Boston Pops, performing Gershwin’s Rhapsody in Blue. 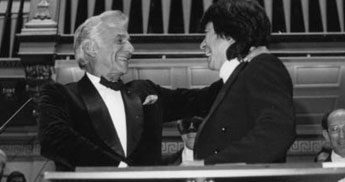 Bernstein appoints a young Seiji Ozawa to serve as an assistant conductor at the New York Philharmonic for the 1961-1962 Season. 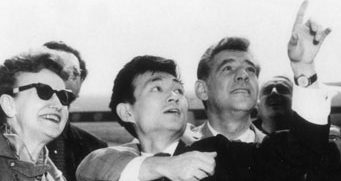 Ozawa is also invited to accompany the New York Philharmonic on their Spring 1961 tour to Japan. Bernstein conducts the Koussevitzky Memorial concert at Tanglewood. The program includes Harold Shapero’s Symphony for Classical Orchestra, Stravinsky’s Symphony of Psalms, and Tchaikovsky’s Symphony No. 5. World premiere of Bernstein’s Symphony No. 3, ‘Kaddish’ by the Israel Philharmonic Orchestra in Tel Aviv, by permission of the BSO. Charles Munch conducts the BSO in the American premiere performance of Bernstein’s Symphony No. 3, ‘Kaddish’ in Symphony Hall. The work was commissioned by the BSO and the Koussevitzky Music Foundation in conjunction with the BSO’s 75th anniversary. Listen below to an excerpt from the February 1st performance. Click ‘Read More’ to hear Bernstein conducting Rossini’s Overture to the Barber of Seville. Bernstein attends Seiji Ozawa’s conducting debut with the BSO at Tanglewood where Ozawa conducts Bizet’s Symphony in C, Hindemith’s ‘Mathis der Maler’ Symphony, and Moussorgsky’s Pictures at an Exhibition. Click ‘Read More’ to view the program. Bernstein returns to Tanglewood to help celebrate the 25th anniversary of the Tanglewood Music Center. He conducts the final act of Carmen in concert form, leading a vocal cast made up of TMC alumni. Bernstein is named Artistic Advisor at Tanglewood along with Seiji Ozawa and Gunther Schuller. 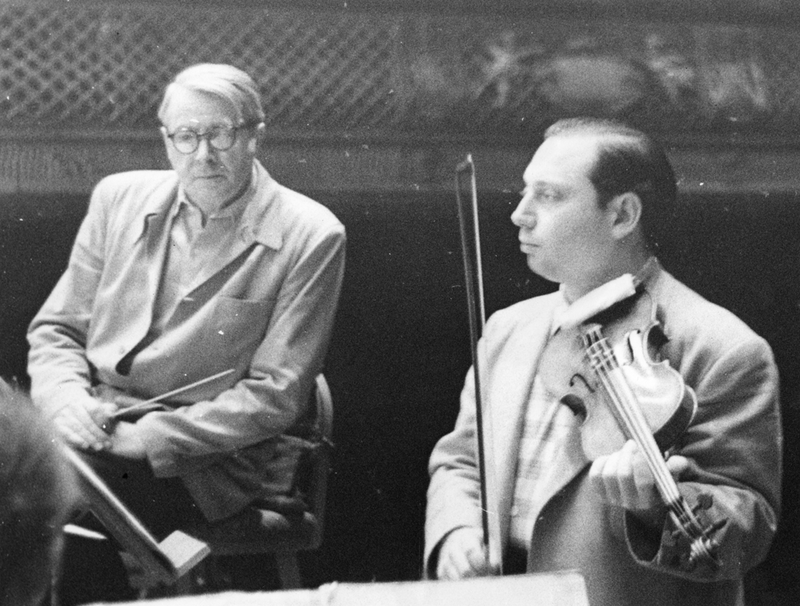 Starting in 1970, responsibilities for Tanglewood were divided between a newly formed “Troika”: Schuller was put in charge of all educational activities, Ozawa was in charge of the Festival programs, and Bernstein served as a general advisor. Bernstein returns to conduct the BSO in Symphony Hall for the first time since the spring of 1956. He leads the BSO in a performance of Beethoven’s Symphony No. 9 as part of the BSO’s Beethoven Festival. 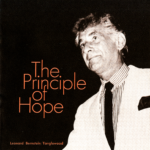 Bernstein gives The Principle of Hope speech at the Opening Exercises of the Tanglewood Music Center. Listen to the full speech below. Bernstein conducts the BSO in a performance of Mahler’s Symphony No. 2, ‘Resurrection’ in the Koussevitzky Music Shed. Bernstein conducts the BSO in a performance of Brahms’ Symphony No. 4 in the Tanglewood Music Shed. Bernstein conducts Stravinsky’s Oedipus Rex with the BSO. The work is recorded later that month for Columbia (Sony) in preparation for Bernstein’s Norton lectures in 1973. Bernstein delivers a series of six lectures at Harvard University as the Charles Eliot Norton Professor of Poetry. Here is a video clip of Bernstein conducting members of the BSO and the Harvard Glee Club in a performance of Oedipus Rex during the sixth lecture, “The Poetry of Earth”. Bernstein conducts the BSO in a performance of Tchaikovsky’s Symphony No. 5 for the Koussevitzky Memorial concert in conjunction with the Koussevitzky Centennial at Tanglewood. Bernstein records Liszt’s Faust Symphony with the BSO at Symphony Hall. Audio and video recordings were made simultaneously, with audio released by Deutsche Grammophon and video released by Amberson Video, Inc.
Watch a second clip and see the concert program by clicking on the Read More button. Bernstein conducts the BSO in a performance of Mahler’s Symphony No. 9 at Tanglewood, his only performance of this work with the BSO. Seiji Ozawa conducts the BSO in the world premiere performance of Bernstein’s Divertimento for Orchestra in Symphony Hall. 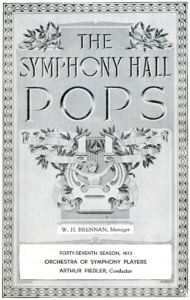 The work was commissioned by the BSO for its 100th anniversary. 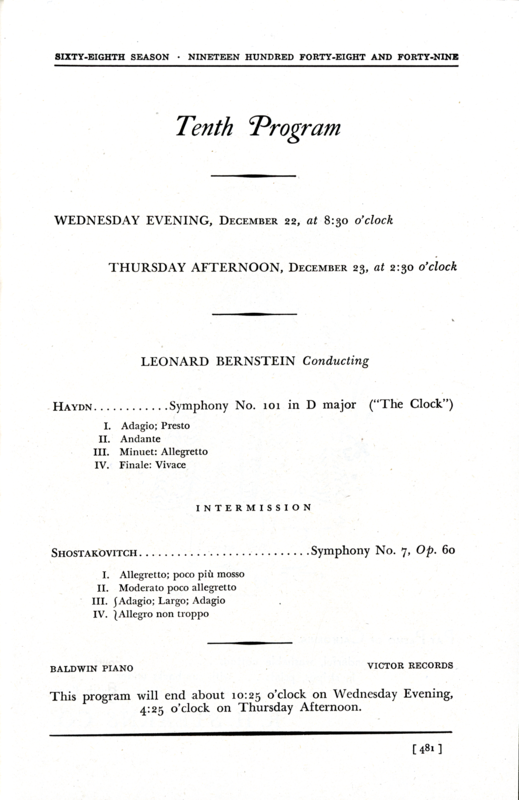 Bernstein conducts a repeat performance at Tanglewood on July 4, 1981. Click ‘Read More’ to view photos, score, and program pages. 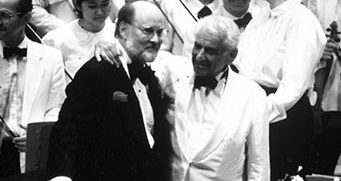 Bernstein conducts the BSO at Tanglewood in the American premiere of his work Ḥalil with Doriot Anthony Dwyer as flute soloist. The concert also includes a performance of Bernstein’s Divertimento for Orchestra. 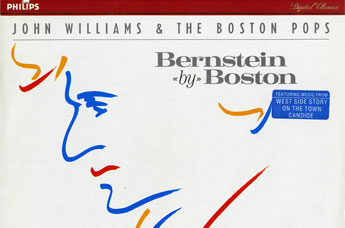 John Williams and the Boston Pops record works by Leonard Bernstein for a recording released in 1986 on the Philips label titled Bernstein by Boston. 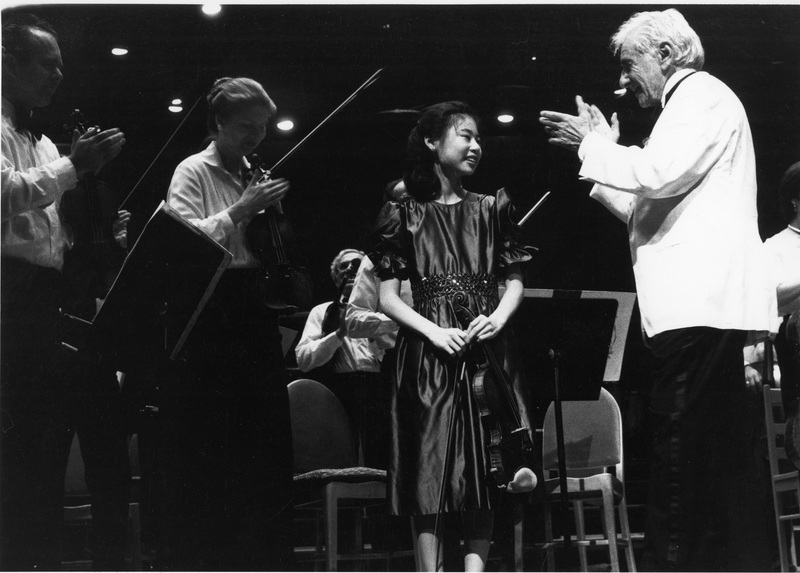 14-year-old violinist Midori performs Bernstein’s Serenade for Violin and String Orchestra after Plato’s Symposium. The E-strings on two different violins she played broke causing her to swap instruments with BSO violinists during the performance. Leonard Bernstein conducts the Tanglewood Music Center Orchestra in a performance of Stravinsky’s Rite of Spring in the Shed, August 11, 1987. Leonard Bernstein conducts the BSO in a performance of Sibelius’ Symphony No. 5 on August 15, 1987 in the Shed as part of the Tanglewood 50th anniversary. Marin Alsop studies conducting with Bernstein as a TMC Fellow (1988, 1989). Watch an interview where she discusses Bernstein’s impact on her conducting career with Dean Robert Blocker (Courtesy Yale School of Music, 2018). Click Read More to see photos of Alsop and Bernstein. Tanglewood Gala Concert for Bernstein birthday. Lauren Bacall sings Sondheim’s “The Saga of Lenny” with Paul Ford at the piano and lyrics adapted for “Bernstein at 70!”. Bernstein conducts the BSO in a performance of Tchaikovsky’s Symphony No. 5 at Tanglewood’s annual Serge and Olga Koussevitzky Memorial concert. Bernstein conducts the Boston Pops as part of Harvard Night at Symphony Hall in honor of his 50th Class Reunion. Listen below to the third movement of Bernstein’s Divertimento, March – The BSO Forever. Click ‘Read More’ to see the concert program. 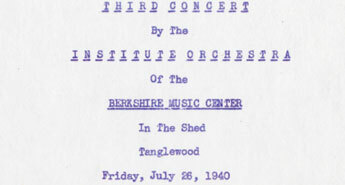 Bernstein conducts the Tanglewood Music Center Orchestra for the last time in a performance of Copland’s Symphony No. 3. Listen below to an audio excerpt. 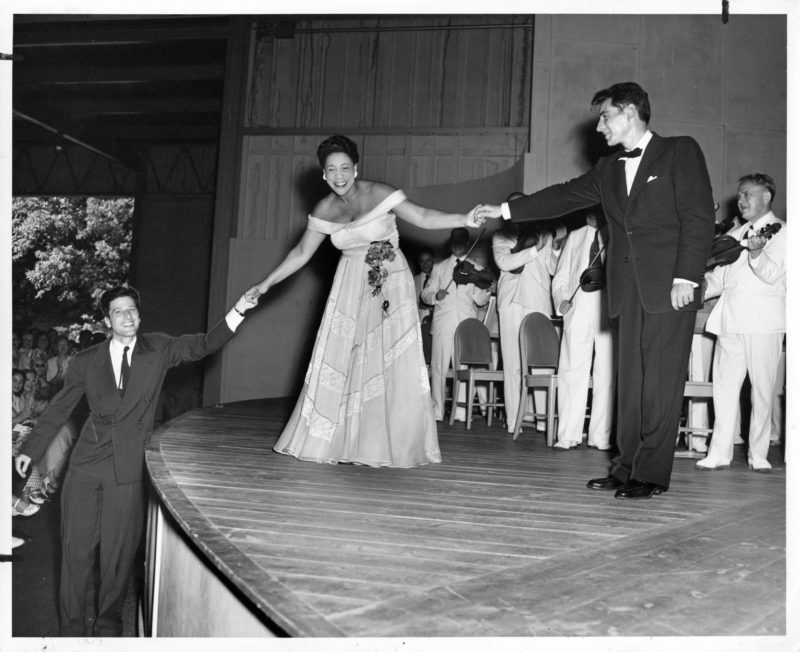 Bernstein conducts the BSO at Tanglewood in his last concert. Watch excerpts from Beethoven’s Symphony No. 7 below.